Moments in Time: Mosaic Monday: Scrapblog Giveaway! I discovered blogging and scrapblogging at about the same time. It was June 2008 while Hannah and I were at the beach. Suddenly, my world became much larger! I not only became a blogger and scrapblogger, but I met new friends from all over the world each time I clicked "publish." All you have to do is leave a comment on this post, and you'll be entered in the drawing. If you're the lucky winner, you can either print one of the scrapblogs you've already created, or create something new. It's so easy! So, go ahead, leave a comment! The deadline is Friday, August 28. Your pages are so creative! Looks like a lot of fun! your book looks really interesting. I would love to see them enlarged to see details. It's a nice mosaic. Wow! I had no idea how cool a scrapblog was. These are amazing! Okay, I've never heard of a scrapblog before, but if your mosaic is showcasing scrapblogs that you've created, I think it's awesome. Like Millie, I would love to see them in more detail. I really like your mosaic. It's quite original. I've gotta confess, I've peeked through a few of your scrapblogs but only ever commented on one... But I loved them all! What a great idea to make a book from them, I think I remember Octamom saying (blogging??) something about doing that a while back. I'll need to have another go at it now that I have a faster computer. What a great mosaic of so many beautiful scrapbook layouts. Beautiful pages. I've never heard of scrapblogging before. I'm a big scrapbooker when I get time, so this really intrigues me! Count me in! Count me in...I love digital scrapbooks and this looks cool. Wow. your pages are beautiful. I'm a graphic designer by profession, and I've never heard of scrapblogging, but the idea sounds very clever. 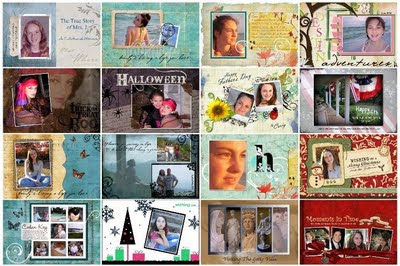 Very cool layouts for your scrapblog! Scrapblogging - sounds lovely. I'll have to look into it! Wow. I could have a lot of fun with this. I'm in! Scrapblogging is very fun! It gets the creative juices going. I know there is a community in and of itself among you and what a fun group! I have loved using scrapblog to create my blog headers and buttons. Your scrapblogs are wonderful! I had not heard of scrapblogging before. I will check out the website you listed. Thanks for sharing, and do enter me in the giveaway. this looks like fun! and so creative.